I played fetch with a cat. A black and white cat enamored with a tiny stuffed toy that resembles a Christmas stocking, only it’s hot pink with a silver cross-stitch, not red. The entire experience was striking. First, I had no idea that cats fetched. Fetching, so far as I knew, is something dogs do—even if, like Galen, they don’t necessarily do it well. Second, I’m not a cat person (sorry, cat people). I was scratched by a cat when I was four or five, and I’ve never quite gotten over my ensuing fear. I’m also allergic, so I do my best to avoid cats completely. But now I’ve met Tuxedo, and I’m rethinking my antipathy. Tuxedo—he’s aptly named—lives with a fabulous seamstress who rescued me when I was in desperate need of someone to quickly and expertly tailor several dance costumes to fit my twelve-year-old’s slender frame. When I picked up the costumes, I brought still one more, and the seamstress offered to sew it on the spot. So while she stitched, I sunk into the black leather couch in her living room. I was about to reach into my purse, which I’d set on the coffee table, when Tuxedo jumped up and began rubbing the right side of his head and his long white whiskers back and forth across the top of the purse. Wonderful, I thought. Cat hair. I glared at him. Perhaps sensing my displeasure, Tuxedo stepped away from the bag—and me. But only temporarily. In the time it took me to pull my phone from my purse, he returned. But not to the table—to the couch. And he brought his tiny pink toy, which he dropped in my lap. Instinctively I threw it, and he retrieved it. I looked at him quizzically. Cats don’t fetch, I thought. I do, he seemed to respond, batting the toy against my leg. I threw it again and again. 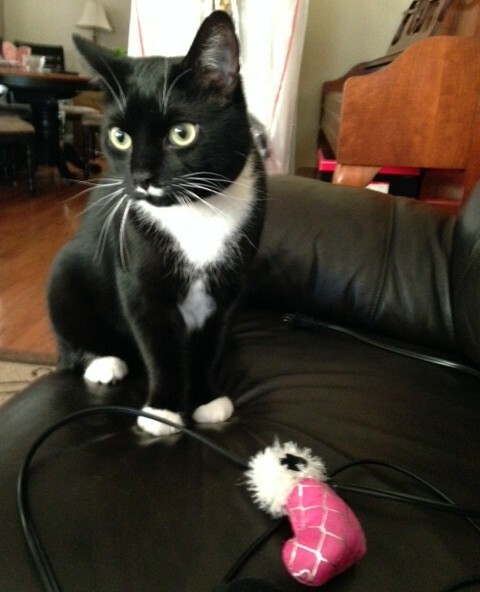 The seamstress told me Tuxedo hides toys throughout the house, so no matter where he is, he has a toy at the ready. She added that he’s been fetching since she brought him home several years ago from a New Jersey shelter. While researching my book, Dogland, my focus was on the plight of shelter dogs, but in my travels, I learned that the situation for homeless cats in this country is even more tenuous. According to the American Humane Association, an estimated 71 percent of cats that enter U.S. animal shelters are euthanized. This is largely due to a burgeoning population of feral cats and the fact that fewer cats than dogs—only 2 percent of cats—are reunited with their owners. My younger daughter would love us to adopt a cat. In her stuffed animal days she collected an assortment of cats in various sizes and colors—one even meowed and moved its limbs. She holds my cat allergy against me and says that when she lives on her own, she will adopt both a dog and a cat. I can’t believe I’m saying this, but I hope she does. And I hope, like Tuxedo, the cat will play fetch. I’m game! This entry was posted in cats, dogs, fetch, shelter. Bookmark the permalink. We temporarily cared for a homeless cat when I was a kid. We named it Scrounge (I still have no idea if it was male or female), and it really was a great cat. Until it got into the house and killed my brother’s phenomenal parakeet, Mica. That was the last I saw of Scrounge. Not sure what the moral of that story is, except maybe that a caged bird and a wild cat dont mix very well. I’m sure Brian WIlliams could embellish it a bit more. Glad to learn at least some family members are reconsidering their feelings about cats. Nora does play fetch with an elastic band but ignores all other toys I’ve ever purchased. If my building allowed it, I would also own a dog. Too many animals are in need of good homes. Funny how dogs and cats are choosy about which toys they will and will not play with. Galen is the choosiest! Mom here….aren’t you the brave one! Any sneezing after being with Tuxedo? You might have outgrown your cat allergy, making one daughter very happy:)). Of course, your sister wouldn’t be able to visit. That is, unless she has outgrown it also. Nice story and I need a seamstress!! No sneezing. If you want to go all the way to Flemington, she’s a great seamstress–quick, quality-work, and cheap.